Another place where a member can be added to a team is on the volunteer's manage profile page. Once you click on the ‘Scheduling’ link, it will open the Scheduling window. This is where you select the Venue, Shift and Position for the team. At the bottom is where you can select the date/s that the team is volunteering. You can either manually choose available dates or schedule by ‘Day of Week’ (e.g. Every Monday). Hit Save. Again, it will open the Scheduling window for you to schedule the member. You’ll only need to select which member you are scheduling. As for the date/s, you can only schedule the member for date/s within the Team’s schedule. As the admin, you can also log hours for the team and/or its members. Logging hours can be done in two ways: entering hours or taking attendance. When logging hours, you need to specify whether you are logging hours for the entire team or its member/s. 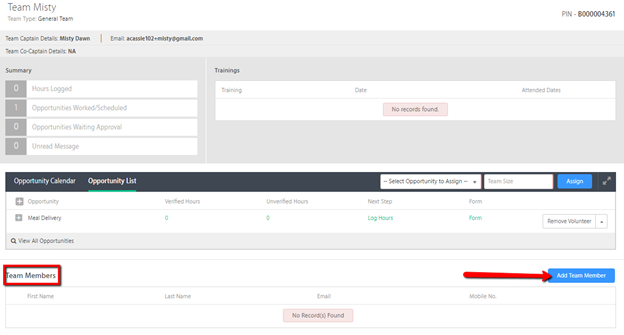 You need to select the Assignment, Date then enter the hours with or without description. As what is noted on the screen, "Adding hours for the Team will be reflected for the Team only. 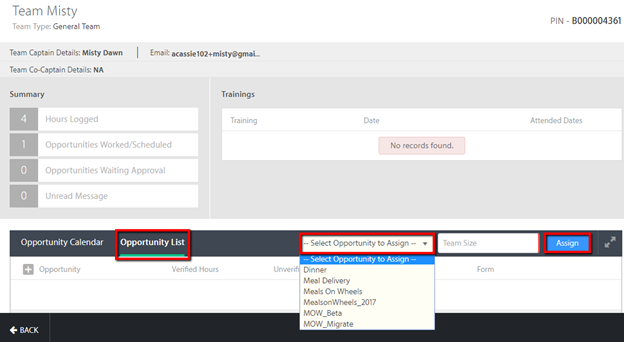 Adding hours for Team Members will be reflected in that team member's profile, as well as overall Team's profile." Taking attendance is done by "checking in" the team/members. Once you check them in, the number of hours scheduled for that shift will automatically be credited to the volunteer.